news and strategies for the evolving mortgage market THEMREPORT.COM MAY 2017 Embracing the lessons of the housing crisis and its recovery, Wells Fargo's Joe Ohayon is focused on revitalizing relationships, mortgage education, and borrower outreach to help bolster sustainable homeownership and the bank's larger initiatives. 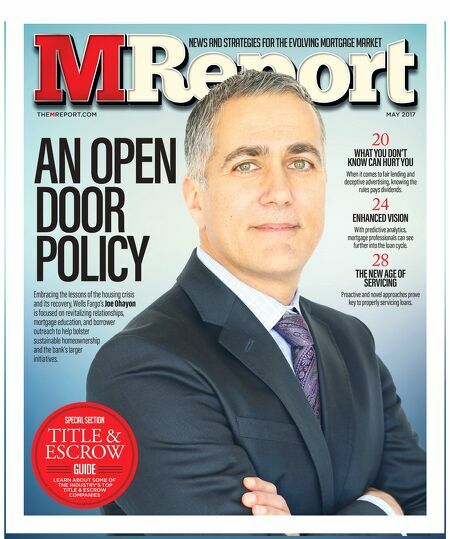 AN OPEN DOOR POLICY Special Section TITLE & ESCROW Guide LEARN ABOUT SOME OF THE INDUSTRY'S TOP TITLE & ESCROW COMPANIES 20 WHAT YOU DON'T KNOW CAN HURT YOU When it comes to fair lending and deceptive advertising, knowing the rules pays dividends. 24 ENHANCED VISION With predictive analytics, mortgage professionals can see further into the loan cycle. 28 THE NEW AGE OF SERVICING Proactive and novel approaches prove key to properly servicing loans.